Congratulations on your new TKTalkie! This Quick Start guide will show you what to do next to get started. Before getting started, take a moment to familiarize yourself with the connections on your TKTalkie. If you experience any issues with getting your TKTalkie up and running, please visit the Troubleshooting page first. There you will find solutions to the most common issues. Depending on the case version you have, the placement of connections will differ. The Imperial case has 3 screws on the top as well as a recessed logo and viewports for power and BLE LEDs. The BLE is contained inside the case. It has both the line-out and PTT connections. 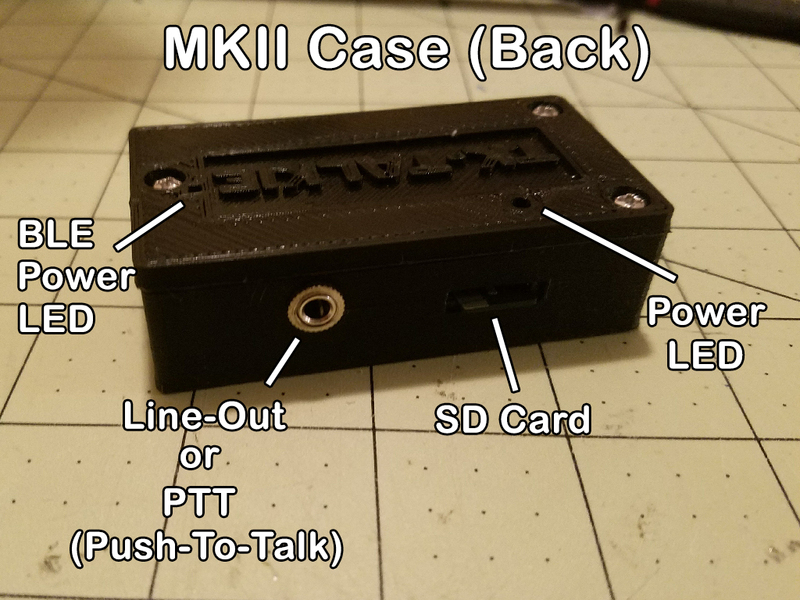 The MkI case is characterized by 4 screws in the lid and an external BLE connection on the side. 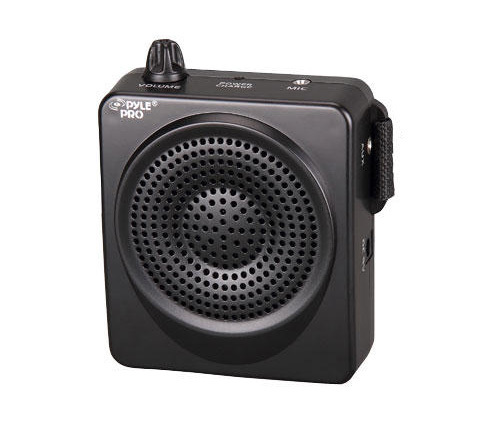 A speaker and microphone - Commonly used speakers are the Aker 1506 and Pyle Pro. They both come with wired microphones. 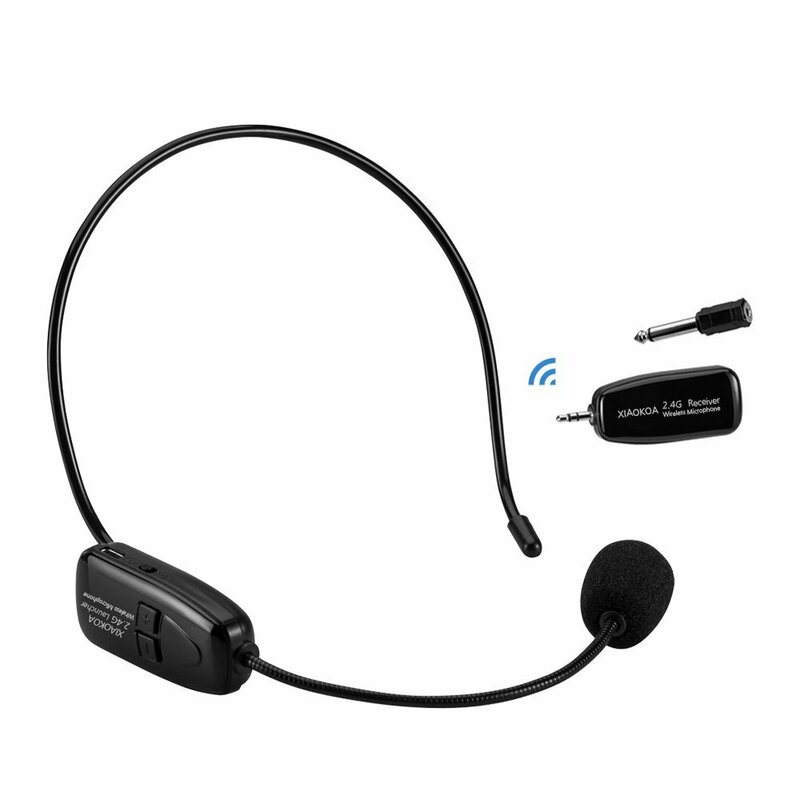 Depending upon your setup, you may want to purchase a wireless microphone such as this one. 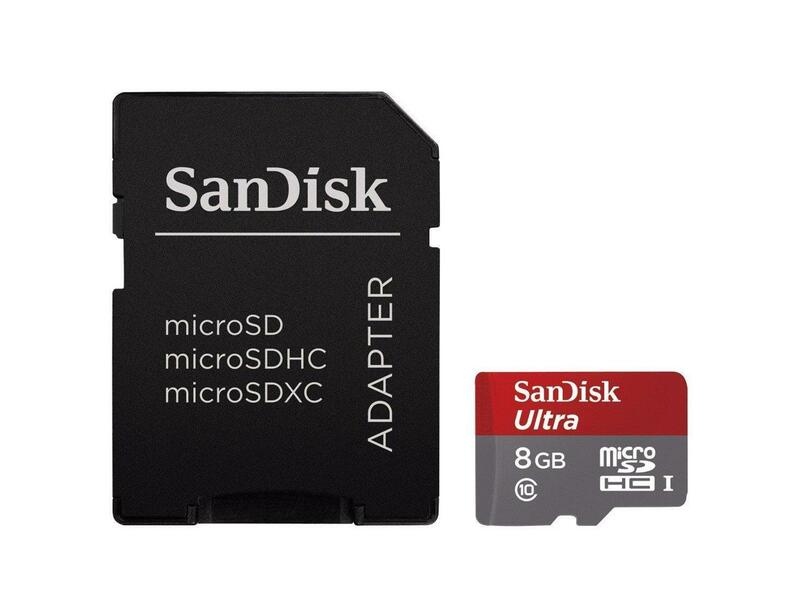 A Micro-SD Card - If you did not order a pre-loaded SD card with your TKTalkie, you will need to purchase one to hold your sound files and configurations. It should be a Class 10 and can range in size from 4 to 32 gigabytes. 8 gig SD cards are the most commonly used and provide more than enough room. 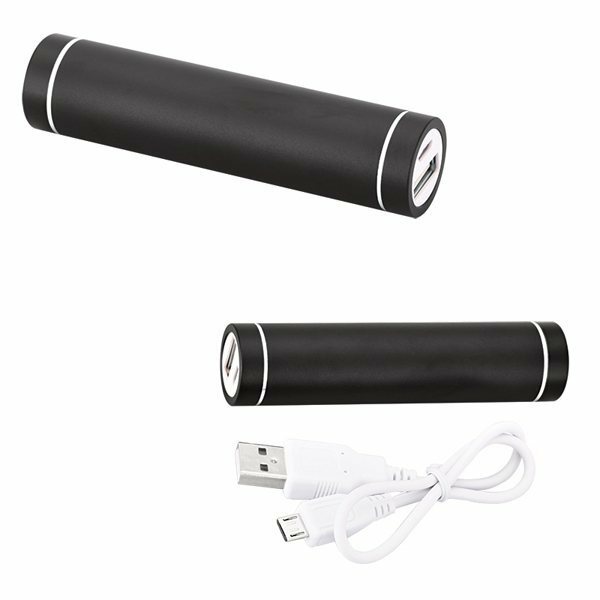 A power supply (battery) - Your TKTalkie will run off of a standard 5V "lipstick" style battery like this one, most commonly used for recharging cell phones. IMPORTANT: It should NOT put out more than 1 Amp of power. The board used for TKTalkie has an overcurrent protection built in and will automatically shut off if it recieves more than 1 Amp. Cables - Standard 3.5mm (1/8") cables, mono or stereo, can be used to connect your TKTalkie to you speaker. 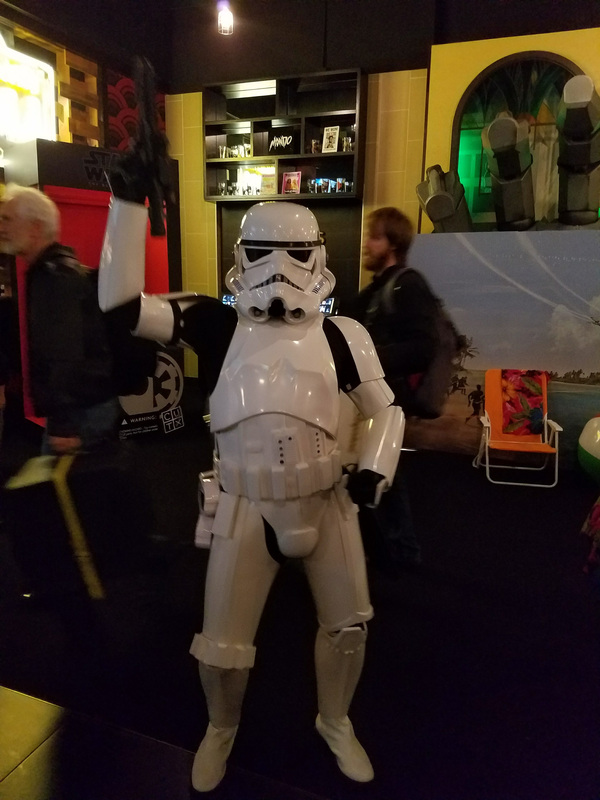 If you are mounting your speaker and TKTalkie behind your chest plate or in another costume with limited space, it is recommended to get cables with right-angle connectors, or right-angle adapters for your cables. NOTICE!!!! Make sure your TKTalkie is powered-OFF for this step! This is used to hold configuration and sound files. Non-sequential read cards, such as the SanDisk Ultra cards, work best. It should be a Class 10 card. You can use a card up to 32Gb in size, although an 8Gb card will be plenty. Visit the Downloads page to grab a ZIP file of everything you need to get you started, including sound files and background loops. Unzip the contents and copy them to your SD card. Once you have loaded your SD card, insert it into the SD card slot on the back of your TKTalkie. The metal connectors on the card should be facing down. If you have purchased your TKTalkie with the Bluetooth option, download the companion app from either Google Play™ or the App Store™. Just search for TKTalkie, or click a link below. Checkout the app page for more information. This step is only for MkI case designs! The MkII/Standard/Imperial contains the BLE on the inside. Make sure your TKTalkie is powered-OFF for this step! 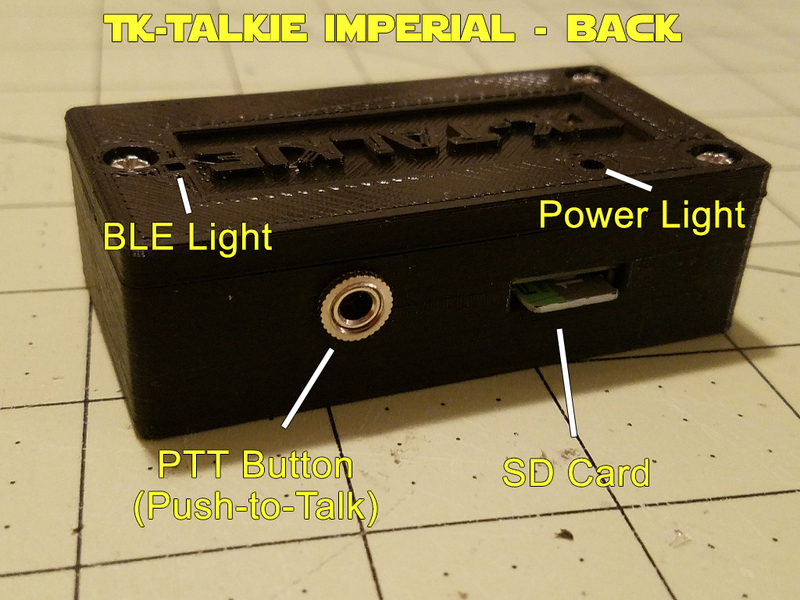 If you purchased your TKTalkie with the BLE option, connect your BLE adapter to your TKTalkie using the input jack on the side (shortest face) of the unit. 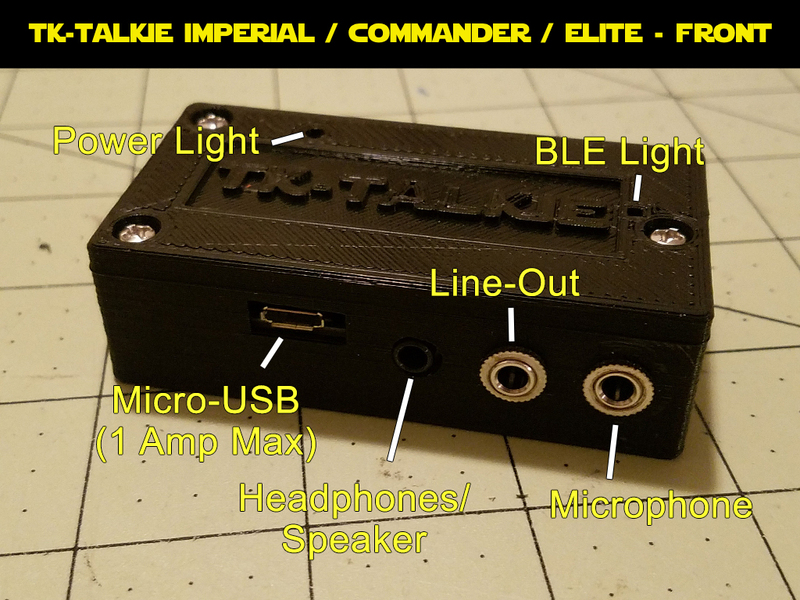 When you power on the TKTalkie, the light on the BLE will blink slowly. When a connection is made, it will be solid. 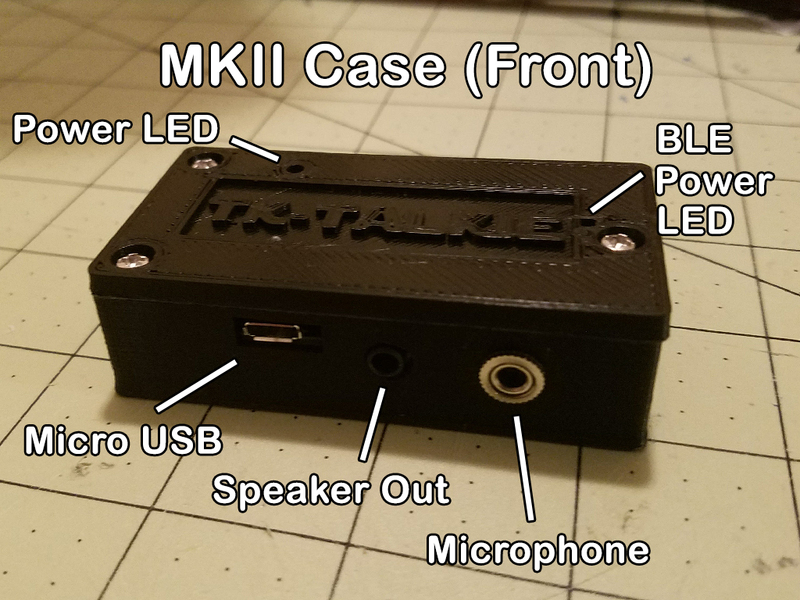 Insert your microphone into the jack that is to the left of the micro USB connector on the front of the TKTalkie. You can use either a wired microphone (such as the one that comes with an Aker or PylePro amp) OR a wireless microphone. You will use the Volume setting to adjust your input level. If you are using a powered microphone, setting this to "1" should suffice. 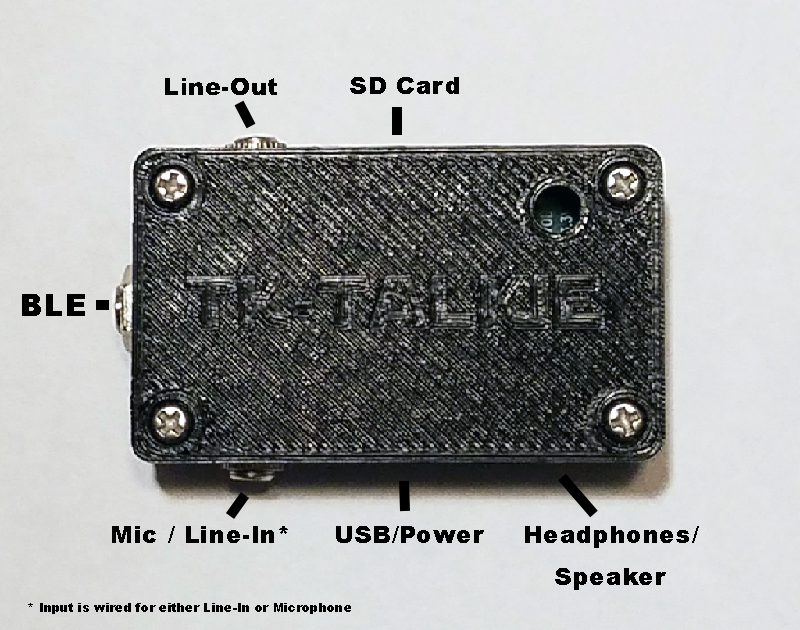 If your speaker has a "Line-In" or "Aux" jack and you configured your TKTalkie with a Line-Out jack for the rear connection, you can connect speaker to the jack that is next to the SD card slot in the back of the TKTalkie. This is the Line-Out connection. You can the use the Line-Out setting on the app to control volume. You can use the headphone jack on the TKTalkie that is located to the right of the micro-USB connector on the front and plug this into the input jack on your speaker. You should start with both the volume on the TKTalkie and the speaker low to avoid sudden feedback. You can then use the Volume setting on the TKTalkie as well as on the speaker to adjust your output level. 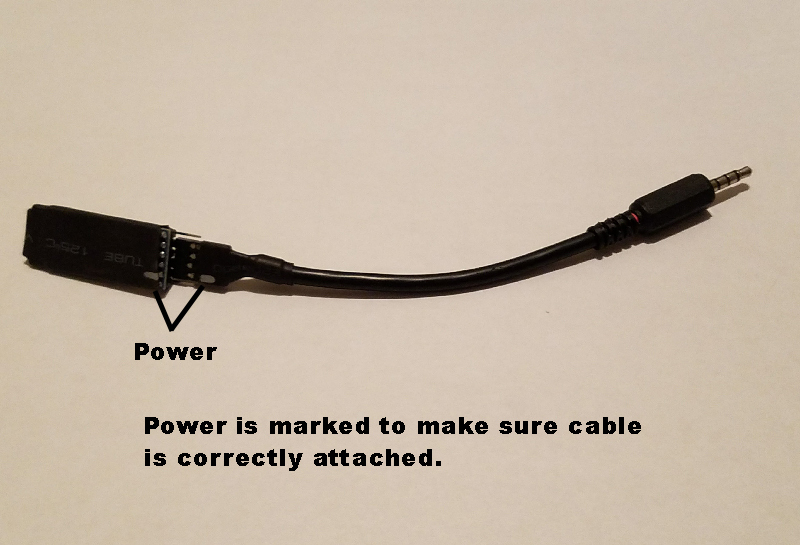 Connect a 5V power supply to the TKTalkie using a micro-USB cable (for example a 5V phone battery charger.) You can also connect it to your laptop or computer. You should hear a startup sound play and should be able to start talking! You can then use the mobile app (if you purchased the Bluetooth option) to tweak your settings, or edit the configuration files on the SD card directly. 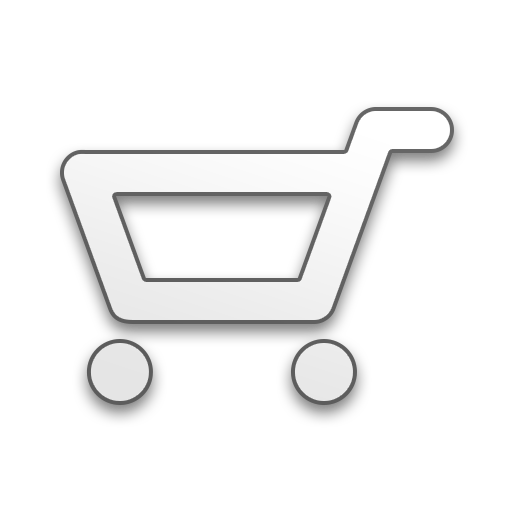 If you experience any issues, please visit the Troubleshooting page. Now get out there and troop!